Once the file (Word Document, PDF, Excel or Powerpoint) has been uploaded Batterii will automatically generate an image from the first page of the asset. Go to the appropriate Wall and click the "+" to Upload to the wall. Click Upload to select your file from your computer. 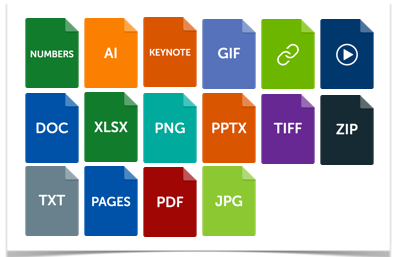 The file can be a Document, PDF, Excel, Presentations and more. The file will automatically upload to the Wall and click "Close" once it has been added. Or drag and drop multiple assets to a wall and all will upload simultaneously. After uploading the asset Batterii will work to generate an image for each uploaded asset. After generating an image for each asset, double click on an asset to update/change the Name, add a Description and tags. If you don't like the image that was automatically added to your asset you have the option to "Remove Image" or "Replace Image". Double click to view the asset. Use the Image button in the lower corner and select "Replace Image"
You can upload a new image for your asset. For assets not currently supported with auto-generation of an image (pages, Keynote, numbers and more) you will always have the option to "Upload an Image" for the asset. Sorry we don't currently support PSD, SVG or .sketch files as uploads.